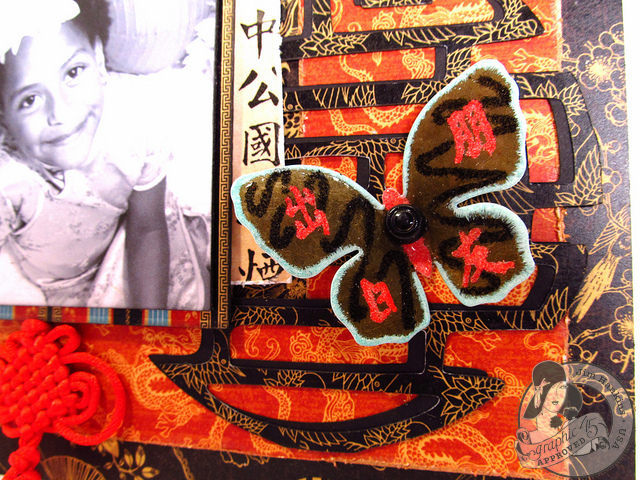 The Gentleman Crafter: Graphic 45 CHA Layout Project Reveal Today! Thanks for coming over! Today, please join me over at Graphic 45's blog as they reveal several incredible layouts by fellow DT members, the totally talented and amazing Tara Orr, Jane Tregenza and myself. Of course I have been paired with two of the BEST layout artists around! Good Heavens! If you read yesterday's post, I was saying that this was my very first layout EVER! Out of all the things Graphic 45 asked us to create for their booth at CHA this was the doozie for me! I mean DREADED DOOZIE with sugar on top! How many YouTube videos can you watch to find out how in the heck this is done! Seriously, if you did a YouTube video on a layout, chance are I saw it! LOL! I stand totally amazed and in awe at all you layout artist in the world! I totally stared at 12 x 12 pages for hours! I was assigned Bird Song to make my layout, which you may not know this, but it wasn't even in print yet. We used the sample paper which meant simply...NO MISTAKES! LOL! That added a little more pressure huh? GREAT! :) I do want to say this, once I glued just one little piece on top of the main page, I was off. My mind started to work and it was OK. So lesson learned for me...Just start! Please take a moment and check out the other AMAZING layouts on the Graphic 45 blog today! OmG! You niece is so adorable. Love, love, love the outfit and the staging was perfect. Your cluster of flowers and birds are just beautiful...Well done! Thanks Zan! OOdles of hugs coming your way! This layout is fantastic. You are a true talent I say! Great job. The birds and flowers just pop. And your niece is a cutie pie. May I ask, what did you use to make the centers of the flowers? Good Morning Sharon! Thank you so much! The punch used is the McGill's Stamen Punch. It's so cool! As always, Thanks Mary! Glad you liked it! I love how this comes "off the page!" If this is the first, you're a pro already! Love the use of the tree branch to anchor the flowers. Are those Chopsticks? Genius! 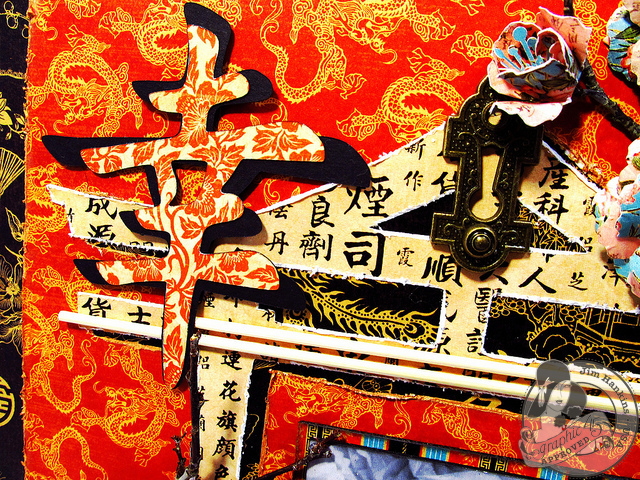 Will you share how you cut out the chinese symbol? Who says that Jim can't do this.... NOBODY! You are so amazingly gifted in the ways of ART. Even at something that you have never done, you hit a Homerun! Love all the dimensional details in the birds and branches... and your niece is just darling!!!! I don't wander into the "land of layouts" very often either - way too much pressure to make it perfect! I love your layout though - gorgeous (as is your niece)! Thanks for sharing and I can't wait for the wallet tutorial. Oh my good gracious Molly!! Awesome! 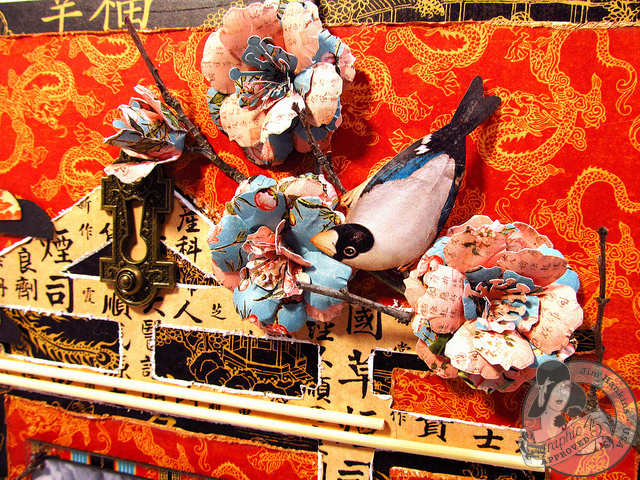 Love the real branches for the bird perches...the Chinese symbol fussy cutting is fab! And the darling model...well, she's gorgeous! Pretty cool for your first LO! Simply STUNNING!!!! Love your use of natural elements, so green and Asian. Your Chinese Symbol is fab. As for your niece, well she is quite simply STUNNING, as well! P. S. Think you nailed your very first LO ever! This is exquisite! The use of the chopsticks is very clever and adds a nice break in color and texture. I think I'll give you an A+. Nice job, Jim!!! Good Lord!! If this is your first layout I hate to think what they will look like when you get "good" at it. Ha!!!! This is absolutely beautiful!! I don't believe it is your first. Are you sure you want card lessons from me? I think you could teach me a thing or two! Love the birds popped off the page. Where do I start? Beautiful niece, layout,papers and designs...! You, my dear are not only a lucky uncle, brother, son; but an amazing talent! Please come and help me with my layouts! WOW! Stunning! I love how you framed your gorgeous niece! I can't believe it is your first! Alas, a LO from The Gentleman Crafter and he never ceases to amaze us with what he is capable of....I had to do a fall 12 X 12 LO recently and I think I should have watched a few more You Tube videos, ha ha...yours is just great. Wow, another beautiful, stunning project you've made. You are certainly one talented guy that's for sure. I just love your style and how you make these amazing, big art pieces with such awesome detail in every aspect of the piece. You have definitely motivated me to start making more three dimensional pieces. I say you've either got a talent for paper art or you don't. And you DO and this is just another form of paper art. 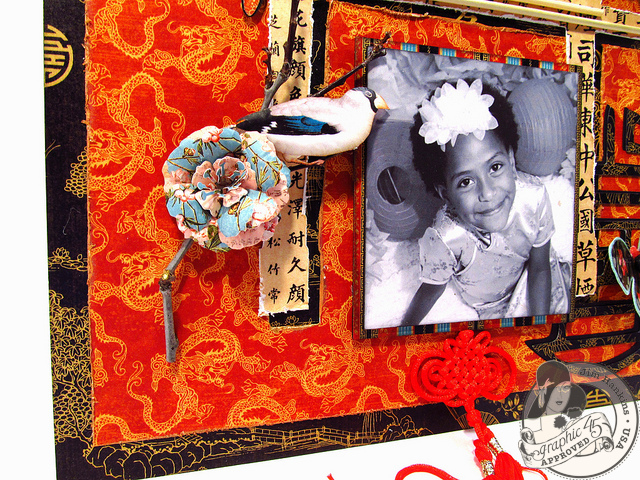 Fabulous layout, beautiful little girl! Is your niece going to be calling every 5 minutes like your mom? BTW... I've looked everywhere for the video of your explanation of how you put your Nutcracker Sweet Suite together. Can you point me in the right direction or am I only dreaming that I saw it? G45 must be ecstatic that you applied for their DT. What a layout. I knew you would work in your 3D magic. It's beautiful, Jim. The photo is perfect with your gorgeous niece.Way to go! Oh my goodness, I haven't gotten any of your posts and thought something happened to you. I googled you and found your new blog!! Glad everything is ok, and I am gonna catch up! PS, I love your flowers and how you used the birds! you do not seige to amaze me...YOUR A RUN AWAY TRAIN!!! You rocked it, Jim! I love that you incorporated "structural" elements in building that awesome pagoda. The page is so well balanced....enough elements to keep it interesting but not at all busy. Your flowers are wonderful! And, the butterfly knocks my socks off. Don't ever doubt yourself...you've got it goin' on! Well, well, well for never ever having done this you created an amazing page layout...i am not a scrapbooker myself but when i see this i think...maybe i might be missing something....beautiful job Jim and your niece is so adorable, you are a blessed man. Doing some catching up...life has gotten in the way big time. LOVE the layout!! For someone who "doesn't do" layouts, you ROCKED it, Uncle Bubba!!! Please give my thanks to everyone involved in the photo shoot for helping you on your maiden voyage to layout land. The photo of Liya Kate is beautiful! I love that they call you Uncle Bubba!!!!!! Your LO was amazing Jim, and how wonderful of your sister to provide the perfect subject at a whims notice. Your family rocks. YOU DONE GOOD, GENTLEMAN JIM! Thanks for the chuckles, and that l/o for inspiration. Oh, my yes, we know that BirdSong wasn't avail when you created this...because we are just now getting our hands on it. LOOONNNGGG wait. Anyhoo, I especially admire your fussy cut birds because they look very real. Lovely. For someone who's not a scrapper, you hit it out of the park! Jim, you must do more - look at the wonderful subjects you have to scrap! I forgot to say....I call my brother Bubba, gotta love these southern terms of endearment. Maybe that's my new name for you!!! Love Ya!!! Your first???? My goodness when then do you classify yourself as a layout artist! I think your already there! 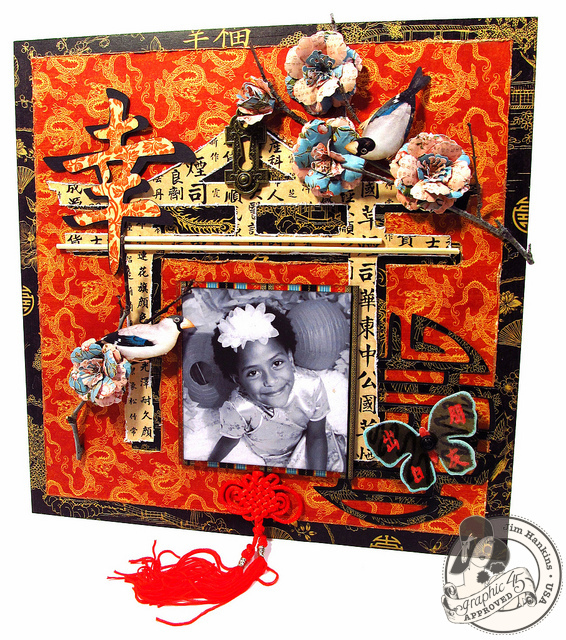 Stunning layout and your niece is adorable in the photo!!! I can't believe that this is your first layout! You were born to do it! I have never done a LO either, but I know mine wouldn't be anywhere near as good as yours. Liya has a beautiful smile and looks so sweet - way to go Uncle Bubba!